See sample biosketches: predoctoral, postdoctoral, general. 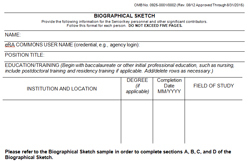 With several training and other grant application receipt dates right around the corner, I want to be sure you know that all competing and noncompeting applications submitted for due dates on or after May 25 must use a new biosketch format. General biographical sketch: Applicants for training, career development, research education (student development) and all other awards except individual fellowships and diversity supplements must use this format (see sample with instructions). Fellowship biographical sketch: Applicants for individual fellowships and diversity supplements must use this format (see predoctoral and postdoctoral samples with instructions). UPDATE: This vacancy announcement has been extended and will now be open for 90 days from April 13, 2015. With the selection of Genetics and Developmental Biology (GDB) division director Judith Greenberg as NIGMS deputy director, the search is now open for an outstanding individual to serve as the GDB director. GDB has supported many of the exciting fundamental discoveries that have led to deeper knowledge of how cells and organisms function as well as to new technologies and approaches. The division is organized into two branches, one focused on genetic mechanisms and one on developmental and cellular processes, and has 11 scientific staff members who serve as program officers. While concentrating on general principles of genetics, gene expression and developmental biology, often using model organisms, research supported by GDB underpins studies on human health and disease. This position offers important opportunities to set scientific priorities, lead change and improve the research enterprise. The division director reports to the NIGMS director and is a member of the NIGMS senior leadership team, which helps set policies and priorities for the Institute. There are also opportunities to participate in and advise on NIH-wide activities and collaborations with other federal agencies. Candidates must have an M.D., Ph.D. or equivalent degree in a field relevant to the position. The ideal candidate will have considerable research experience demonstrating a strong understanding of genetics, gene expression, and/or developmental biology. In addition, candidates should possess recognized research management and leadership abilities. Broad knowledge of the fundamental mechanisms of inheritance, development and cell function is desired. We support a variety of resources for biomedical research, and we’re considering a new addition: one or more facilities for protein expression. These resources would offer protein expression expertise and high-throughput expression capability for the benefit of the entire research community. We just issued a request for information (RFI) seeking input on the needs within the biomedical research community for such resources and the types of protein expression services that would be most beneficial. Examples might include the expression of proteins from a large number of sequences, orthologs and homologs; prokaryotic and eukaryotic protein expression; and expression for special needs, such as for large numbers of mutants, proteins requiring anaerobic expression, and the incorporation of nonproteogenic amino acids like seleno-methionine. How Do You Think We Should Manage Science in Fiscally Challenging Times? An important, recurring discussion topic on our blogs is ways to maximize the impact and sustainability of NIH-funded biomedical research. In 2011, a Rock Talk post on managing NIH’s budget in fiscally challenging times solicited many comments and led, in part, to an NIH-wide policy on special council review for applications from PIs who have more than $1 million in NIH funding. We have also implemented new programs that provide more stable support for investigators over longer time periods. A more recent example of the “maximizing impact and sustainability” theme is an NIGMS Feedback Loop post that discussed ideas for how to optimize the biomedical research ecosystem. We’re each leading an NIH-wide working group focused on topics key to this important theme. One group (chaired by Sally) is exploring ways to decrease the time it takes investigators to reach research independence, and the other (chaired by Jon) is looking to develop more efficient and sustainable funding policies and other strategies. Recently, NIH solicited your comments on an “emeritus award” concept as part of activities of the group chaired by Sally. The group is now in the midst of analyzing all of the comments it received to see what the next steps will be in regard to this type of award. Input on key issues that currently limit the impact of NIH’s funding for biomedical research and challenge the sustainability of the scientific enterprise. Ideas about adjusting current funding policies to ensure both continued impact and sustainability of the NIH research enterprise. Ideas for new policies, strategies and other approaches that would increase the impact and sustainability of NIH-funded biomedical research. Comments on any other issues that you feel are relevant. While we read and consider comments responding to our blog posts, in order to make your input part of our formal analysis of RFI responses, it needs to be submitted via the RFI by May 17.